"Anthropologists visit the temple sites," Mr. Barrios says, "and read the inscriptions and make up stories about the Maya, but they do not read the signs correctly. It’s just their imagination… Other people write about prophecy in the name of the Maya. They say that the world will end in December 2012. The Mayan elders are angry with this. The world will not end. It will be transformed. The indigenous have the calendars, and know how to accurately interpret it, not others." The Mayan Calendars comprehension of time, seasons, and cycles has proven itself to be vast and sophisticated. The Maya understand 17 different calendars, some of them charting time accurately over a span of more than ten million years. The calendar that has steadily drawn global attention since 1987 is called the Tzolk’in or Cholq’ij. Devised ages ago and based on the cycle of the Pleiades, it is still held as sacred. With the indigenous calendars, native people have kept track of important turning points in history. For example, the day keepers who study the calendars identified an important day in the year One Reed, Ce Acatal, as it was called by the Mexicans. That was the day when an important ancestor was prophesied to return, "coming like a butterfly." In the western calendar, the One Reed date correlates to Easter Sunday, April 21, 1519 the day that Hernando Cortez and his fleet of 11 Spanish galleons arrived from the East at what is today called Vera Cruz, Mexico. As we pass through transition there is a colossal, global convergence of environmental destruction, social chaos, war, and ongoing Earth changes. All this, Mr. Barrios says, was foreseen via the simple, spiral mathematics of the Mayan calendars. "It will change," Mr. Barrios observes. "Everything will change." 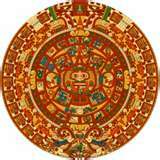 He said Mayan Daykeepers view the Dec. 21, 2012 date as a rebirth, the start of the World of the Fifth Sun. It will be the start of a new era resulting from and signified by the solar meridian crossing the galactic equator, and the earth aligning itself with the center of the galaxy. "Change is accelerating now, and it will continue to accelerate." If the people of the earth can get to this 2012 date in good shape, without having destroyed too much of the Earth, Mr. Barrios said, we will rise to a new, higher level. A Picture of the Road Ahead From his understanding of the Mayan tradition and the calendars, Mr. Barrios offered a picture of where we are at and what may lie on the road ahead: The date specified in the calendar Winter Solstice in the year 2012 does not mark the end of the world. Many outside people writing about the Mayan calendar sensationalize this date, but they do not know. The ones who know are the indigenous elders who are entrusted with keeping the tradition. "Humanity will continue," he contends, "but in a different way. Material structures will change. From this we will have the opportunity to be more human." "On the light side everyone thinks they are the most important, that their own understandings, or their group’s understandings, are the key. There’s a diversity of cultures and opinions, so there is competition, diffusion, and no single focus." As Mr. Barrios sees it, the dark side works to block fusion through denial and materialism. It also works to destroy those who are working with the light to get the Earth to a higher level. They like the energy of the old, declining Fourth World, the materialism. They do not want it to change. They do not want fusion. They want to stay at this level, and are afraid of the next level. Mr. Barrios said the emerging era of the Fifth Sun will call attention to a much-overlooked element. Whereas the four traditional elements of earth, air, fire and water have dominated various epochs in the past, there will be a fifth element to reckon with in the time of the Fifth Sun: ether. The dictionary defines ether as the rarefied element of the Heavens. Ether is a medium. It permeates all space and transmits waves of energy in a wide range of frequencies, from cell phones to human auras. What is "ethereal" is related to the regions beyond earth: the heavens. Ether the element of the Fifth Sun is celestial and lacking in material substance, but is no less real than wood, stone or flesh. "Within the context of ether there can be a fusion of the polarities," Mr. Barrios said. "No more darkness or light in the people, but an uplifted fusion. But right now the realm of darkness is not interested in this. They are organized to block it. They seek to unbalance the Earth and its environment so we will be unready for the alignment in 2012. We need to work together for peace, and balance with the other side. We need to take care of the Earth that feeds and shelters us. We need to put our entire mind and heart into pursuing unity and fusion now, to confront the other side and preserve life." Mr. Barrios told his audiences in Santa Fe that we are at a critical moment of world history. "We are disturbed," he said. "We can’t play anymore. Our planet can be renewed or ravaged. Now is the time to awaken and take action." Develop yourself according to your own tradition and the call of your heart. But remember to respect differences, and strive for unity. Eat wisely. A lot of food is corrupt in either subtle or gross ways. Pay attention to what you are taking into your body. Learn to preserve food, and to conserve energy. Learn some good breathing techniques, so you have mastery of your breath. According to Mr. Barrios this is a crucially important moment for humanity, and for earth. Each person is important. If you have incarnated into this era, you have spiritual work to do balancing the planet. He said the elders have opened the doors so that other races can come to the Mayan world to receive the tradition. The Maya have long appreciated and respected that there are other colors, other races, and other spiritual systems. "They know," he said, "that the destiny of the Mayan world is related to the destiny of the whole world." "The greatest wisdom is in simplicity," Mr. Barrios advised before leaving Santa Fe. "Love, respect, tolerance, sharing, gratitude, forgiveness. It’s not complex or elaborate. The real knowledge is free. It’s encoded in your DNA. All you need is within you. Great teachers have said that from the beginning. Find your heart, and you will find your way." The date 13.0.0.0.0 may have been the Mayas’ idea of the date of the creation of the world. When did the Tzolkin Start? Long Count 13.0.0.0.0 corresponds to 4 Ahau. The authorities agree on this. The Haab was the civil calendar of the Mayas. It consisted of 18 "months" of 20 days each, followed by 5 extra days, known as Uayeb. This gives a year length of 365 days.